Roger Federer came out playing like his legendary self - so much so that Dominic Thiem needed a set to adjust to what he was seeing across the net. Thiem went on to beat Federer 3-6, 6-3, 7-5 and win the BNP Paribas Open on Sunday, denying the Swiss superstar a record sixth title in the desert. Thiem served out the two-hour match that ended with yet another error from Federer, a forehand dumped into the net. Federer was in the final for the third straight year and lost for the second year in a row. He was beaten in a third-set tiebreaker by Juan Martin del Potro last year. 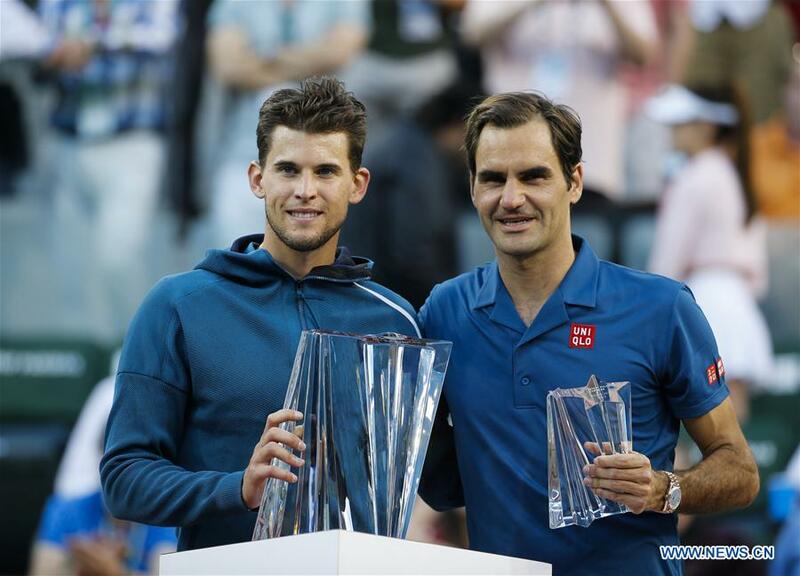 Thiem had lost in his previous two ATP Masters 1000 finals, but the 25-year-old Austrian's solid serve held up against Federer as it had throughout the tournament. Thiem was broken just four times out of 61 service games in the tournament. He didn't lose serve during his semifinal win over Milos Raonic, facing only one break point. Federer and Thiem had split their four previous meetings, but Federer had won both of their hardcourt matches without dropping a set. Thiem also benefited from a walkover, reaching the semis when Gael Monfils withdrew with an Achilles injury. On the women's side, Canadian teenager Bianca Andreescu upset Angelique Kerber 6-4, 3-6, 6-4 to win the title. The 18-year-old Andreescu became the first wild card winner and second-youngest champion in tournament history. "The frickin' champion of Indian Wells!" Andreescu said. "It's crazy!" She overcame nerves, fatigue, and arm and leg issues in the final set to earn the first title of her fledgling career. The Canadian followed in the footsteps of Naomi Osaka, who was a little-known 20-year-old when she won the title last year. Osaka used it as a springboard to win titles at the US and Australian opens while ascending to the No 1 ranking in January.